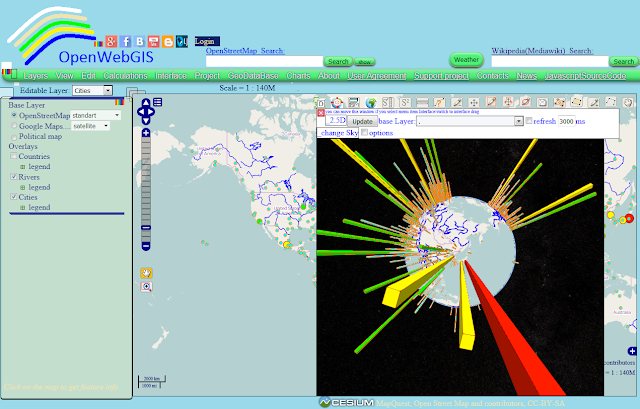 Cesium is used in OpenWebGIS primarily to create 3D View of the maps. Until recently OpenWebGIS has used the version 1.3 of Cesium. But at last it has begun to use the most recent version of Cesium at the moment. 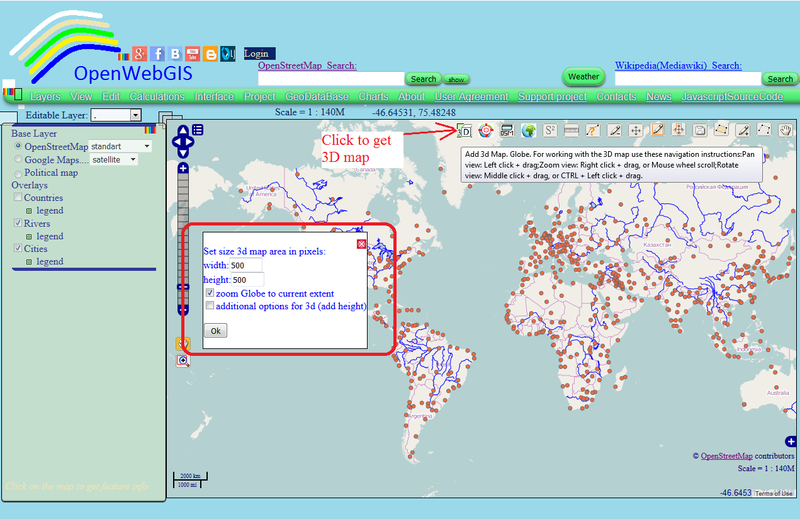 It will give a new impetus to the development of a 3D map in the scope of OpenWebGIS project. For example, users have already had a new opportunity to work with 3D maps: you can now get an url link on your 3D map (previously it was only possible for 2D maps). In addition to the contents of the map in the link, the position and area size of 3D map, is saved. In order to make a link, create your 3D map, and click the button ("Get link ...") at the top right corner of the map as it is shown in Figure 1. After that the pop-up window will appear with options for creating the link. For example take a look at this link to the map with a heatmap of a number of population in cities. Another version of the map where the number of population in the city is shown in different colors and heights of 3D colums shown in Figure 3.
in the upper right corner of the map. This button has the title "Add 3d Map. Globe ". There will be a pop-up window in which you can set the desired size of the 3D map area in pixels (see Figure 4). After setting the area size of 3D map and clicking "Ok", your map will appear on the 3D globe of the Earth(see Figure 5). Rotate view: Middle click + drag, or CTRL + Left click + drag. 1. What you see on 2D map, you can see on 3D on the map when starting 3D map. But you can choose other base layers. 2. 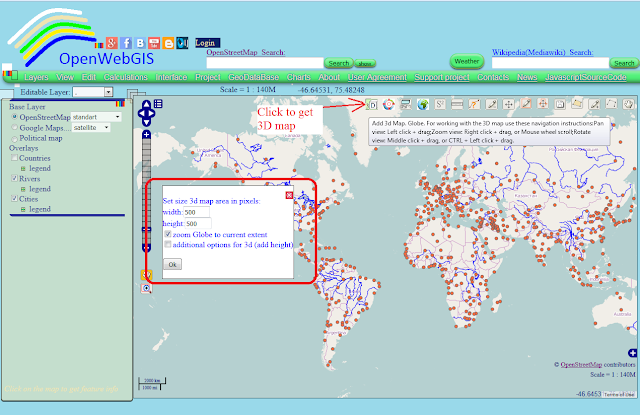 All changes and data editing, you can do only on 2D map. 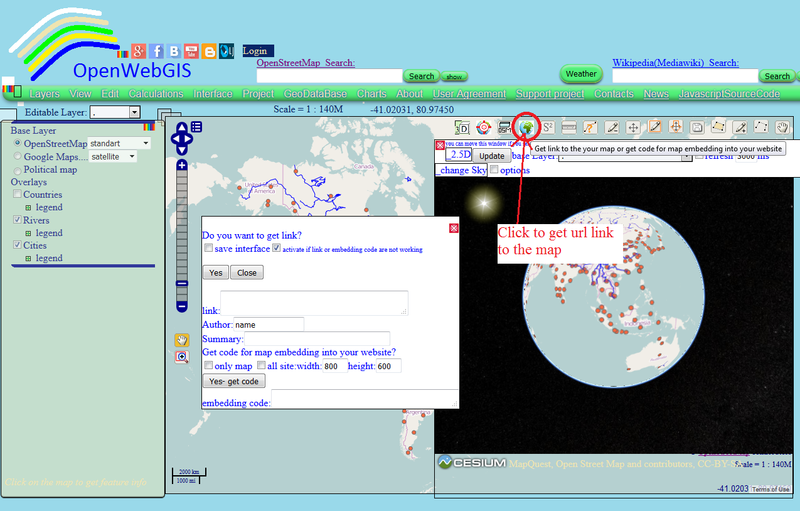 To see your changes on 3D map - click on the Update button over the globe. 3. You can set the automatic data update on the 3D map – to do it, check the checkbox "refresh" and set the refresh time in milliseconds, but keep in mind that this process can be very resource-intensive for your CPU, so think before you set the refresh time is very small. 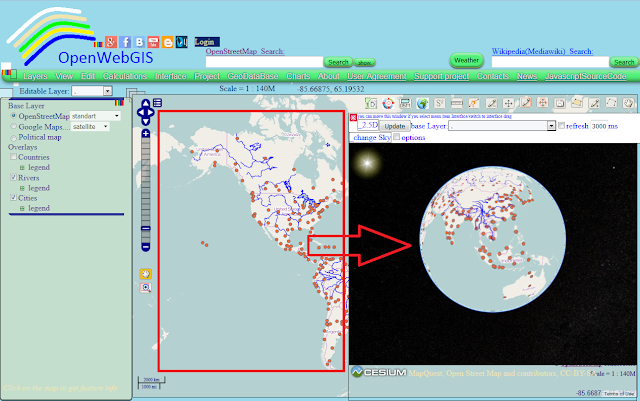 At the moment, the following issue is known when displaying data on 3D map: On the globe of the Earth WMS and Image layers are not displayed if the data for these layers is taken from the servers which do not support CORS technology. "I am using Safari on Mac. The WebGL is disabled by default in Safari. Follow the instructions below to enable WebGL. The WebGL support in Safari is experimental. The 3D interactive visualization may or may not work well. Open the Safari menu and select Preferences. • Click the Advanced tab in the Preferences window. • Check the Show Develop menu in menu bar checkbox at the bottom of the window. • Open the Develop menu in the menu bar and select Enable WebGL. I am using mobile phone / tablet. The 3D interactive visualization may or may not work on a mobile device. It could work in Chrome on Android and Windows 8 devices. But it also depends on the model of your mobile device. My computer is very old. The grahpic card of your computer must support WebGL to make The 3D interactive visualization work. Almost all video cards from NVIDIA and AMD since 2004 support WebGL. Recent Intel video cards also work well. If the 3D interactive visualization does not work in Chrome on your desktop computer, you maybe consider using another computer instead."